The current validation of a cryptographic module (Module) compatible with the OpenSSL 1.0.2 is v2.0.16, FIPS 140-2 certificate #1747. This Module is documented in the 2.0 User Guide; the source code, and Security Policy are also available. For various bureaucratic reasons, the same module is also available as validation #2398 (revision 2.0.16). Neither validation will work with any release other than 1.0.2. The OpenSSL project is no longer maintaining either the 1747 or the 2398 module. This includes adding platforms to those validations. We are starting work on a new validation, after the 1.1.1 release completes. That module will have a small set of validated operational environments. The OpenSSL project is no longer involved in private label validations nor adding platforms to the existing certificates. Here is the complete set of files. Note that if you are interested in the "1747" validation, you only need the three files mentioned above. Please please read the User Guide. OpenSSL itself is not validated. Instead a special carefully defined software component called the OpenSSL FIPS Object Module has been created. This Module was designed for compatibility with OpenSSL so that products using the OpenSSL API can be converted to use validated cryptography with minimal effort. 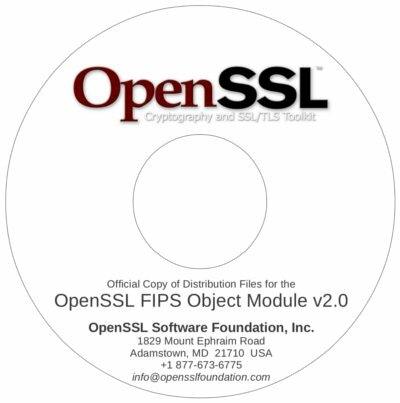 The OpenSSL FIPS Object Module validation is "delivered" in source code form, meaning that if you can use it exactly as is and can build it (according to the very specific documented instructions) for your platform, then you can use it as validated cryptography on a "vendor affirmed" basis. If even a single line of the source code or build process has to be changed for your intended application, you cannot use the open source based validated module directly. You must obtain your own validation.